The following are common questions asked by our subscribers. If you have a question that is not covered here, please feel free to email us. How soon after I submit my Enrollment form can I begin entering information to my account? Once we receive and process your Enrollment Form, we will immediately send you an email confirming receipt of your payment and assigning you an Account ID and Password. You can begin entering information into your account at that point. You can retrieve your password here. Simply enter the e-mail address you used when creating your My Peace of Mind account and answer the security question. We will e-mail you your password. Can I change my information? How soon is new information posted on my account? You can change your information any time you want, as frequently as you want. The new information will be posted immediately. Does the person I allow to access my account have to be a spouse or partner? No. You can designate whomever you want as long as they are at least 18 years of age. What if I want to delete someone who has my password and add someone new? If you have given your password to someone, that person will be able to access your account. If you no longer want that person to have access, you will need to change your password. You would then need to give the new password to those people you wish to have access to your account. Will you sell or share my information, including my email address, with other parties? will I receive a credit for my subscription fee? You may cancel at any time and request that online access to your Member Profile be terminated. However, as stated in the Member Agreement, you will not be entitled to a refund of any fees you have paid. Why do I need the My Peace of Mind services? There are so many reasons to use the My Peace of Mind services, but the main reason is to help protect your assets by simplifying things for you and your loved ones. My Peace of Mind provides a road map to your financial information and lets you identify key advisers so that your loved ones can make sure nothing is overlooked after your death. No one wants what they have earned and sacrificed for to be forgotten about and eventually given over to a state government after their death. By using My Peace of Mind, you will be able to significantly reduce the chance of this happening. Am I safe from someone hacking into my information? 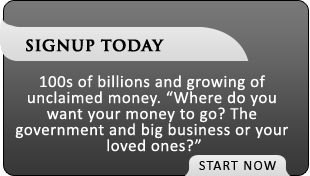 The information on the site is a road map of your financial affairs. It does not contain account numbers or other information that would, by itself, enable someone to gain easy access to your accounts or assets. However, it will help your loved ones handle your financial affairs if you cannot help them do so. It will provide a guide to the person authorized to settle your affairs after your death. The information stored in your Member Profile cannot easily be used by a hacker since it does not contain social security numbers, account numbers, your birthdate, your driver’s license number, etc. Why do I need my life insurance beneficiary information stored on this site? A life insurance policy does not automatically pay benefits to a beneficiary. The beneficiary has to file a claim with the life insurance company. If your beneficiary information is stored on the site, My Peace of Mind will notify your beneficiary about filing a claim. Won't my life insurance company notify the beneficiary for me? What happens to the life insurance proceeds if no claim is ever filed? Why am I doing a search for unclaimed property? 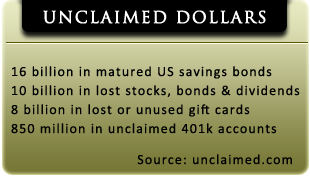 Because chances are, you may have unclaimed property. Tens of billions of dollars in assets go unclaimed every year. 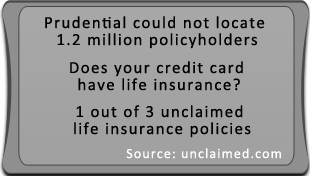 In fact, seven out of 10 Americans are affected by unclaimed property. In the next 10 years, it has been estimated that there will be $14 trillion passed down by the baby boomers. How many more billions and maybe trillions will get lost! When are these monies turned over to the states’ unclaimed property divisions? A state’s unclaimed property laws will determine when a business must turn over dormant accounts or abandoned assets to the state. These laws vary significantly from state to state, particularly in terms of the amount of time that an account must be dormant before it is turned over to the state. Recently, there has been a trend for states to shorten this dormancy period. In many states, an inactive bank account escheats (i.e., is turned over) in as little as three years.